Post-war racing Spitfires are always an interesting sight. This one, originally produced as FR Mk. XIVe serial no. TZ138, was purchased in April 1949 by Messrs Ken Brown and James McArthur with the intention of entering the Tinnerman Trophy Race held during the 1949 National Air Races in Cleveland, Ohio. The buyers obtained the almost new aircraft from Canadian surplus War Assets for a sum of $1,250. The Spitfire received a civilian registration CF-GMZ on August 25, 1949. It received DOT certificate of serviceability and was approved for Class “F” racing. 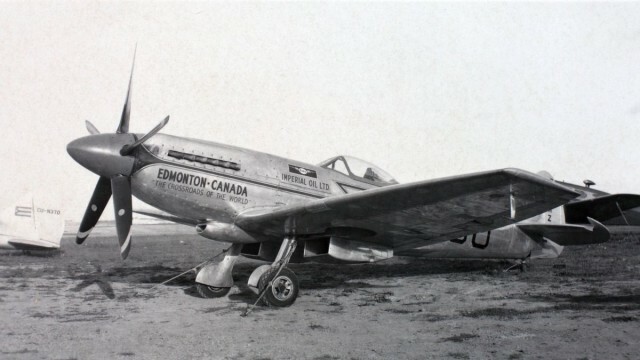 The new owners moved the plane to Edmonton, Alberta, where some of the locals remember it being stuck in the corner of a hanger housing a local ice rink. The preparations were simple, comprising stripping down the airframe to natural metal and removing all unnecessary equipment including the guns. The owners also managed to receive sponsorship from Imperial Oil headquartered in Toronto. The Spitfire received a new livery with blue spinner, red and blue striping, red propeller tips and Imperial Oil logo and the name EDMONTON * CANADA (in red) – The Crossroads of the World (in black). Blue canopy framing and the black racing number “80” completed the finish. 1949 was the first time since 1936 that the Cleveland-based National Air Race Committee had allowed a foreign-build airplane to enter its pylon contest. Conincidentally, 1949 would also be the last National Air Race held in Cleveland. Despite attracting the huge crowds, the dangers that the event posed to the spectators and the surrounding residential area was made painfully obvious as one of a racing P-51s crashed into a house in Berea, killing the pilot and a mother and child inside. 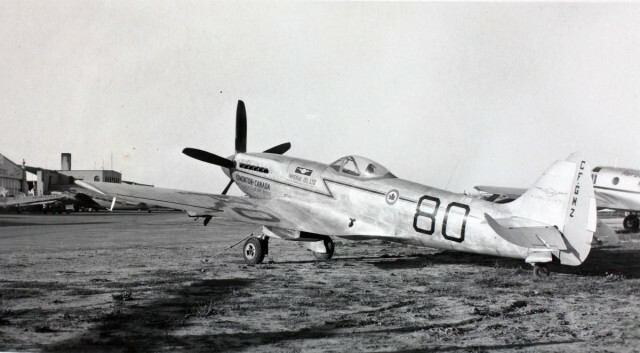 When entering the contest, the Canadian Spitfire turned out to be the only racer retaining all its standard features. Despite this, McArthur did well arriving at the 3rd place at the average speed of 359.565 mph. The winner that year was a modified F2G Corsair piloted by ex-Navy pilot Ben McKillen, who reached a whopping 386.069 mph. The Spitfire’s racing career ended rather abruptly on the following day. Aparently the relations between McArtur and his partners had deteriorated, and while the Spitfire team were celebrating at the awards banquet during the following night, McArtur left the airfield at 6:00am, taking off in the Spitfire with the winnings onboard, leaving no trace of his destination. The next we know about the aircraft is that it was sold in Miami, Florida to a new owner for $1,000. TZ138 survives to this day and is based in Richmond, BC, registered as C-GSPT.